Photo courtesy of Georgianna Lane. Until very recently, if you wanted a bouquet of flowers in Homer, Alaska, you’d be able to pick only from the cellophane-wrapped bunches at the local Safeway or Save-U-More, shipped in from South America. And though there are thousands of peonies growing right in Homer—thanks to a floral gold rush (lots more on that later)—they’re all are shipped down to the lower 48. Rachel, Ben, and their daughter, Sadie. Photo by Thomas J. Story. After getting her master’s in wildlife biology, Rachel realized that she just didn’t love sitting at a desk all day. So she thought, “Let’s try this!” She and Ben set up the high tunnel and planted blooms. “Flowers are so much more satisfying than veggies,” she says. After all—you don’t get to let your creative flow in creating a bouquet of carrots (no offense, carrot farmers). Photo courtesy of Rachel Lord. 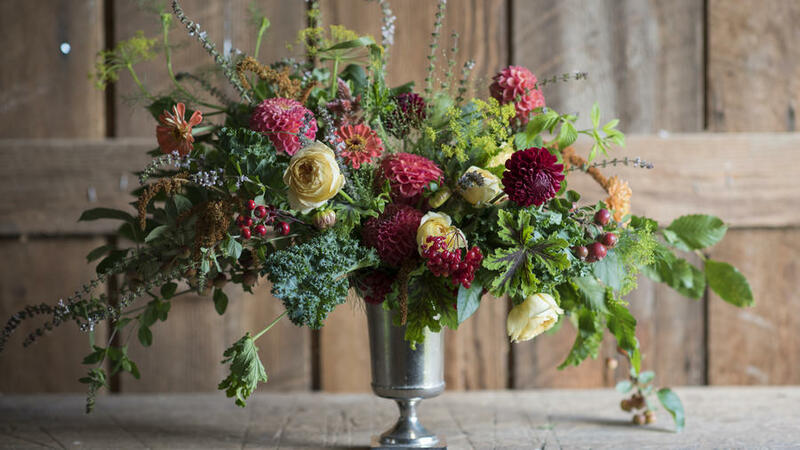 She trained with the best farmer florist around (Washington’s Erin Benzakein of Floret Flowers), but is learning how to tweak her practices to be right for her. So far, succession sowing hasn’t been a success. “The season is just too short,” she says. Zinnias, largely heralded as the easiest flower to grow, are a constant struggle: “It’s just too cold and damp,” she thinks. But a lot does work: the tulips, irises, and dahlias are her staples. Delphiniums sell out instantly, and her Bells of Ireland are going strong at 5 feet tall, and godetia are a new favorite this season. Local flowers, an increasingly important movement down here, is catching on in Alaska—Rachel’s busier than ever between the farmer’s market, weddings, and other events. A recent bounty, headed for market. Photo by Rachel Lord.